Harlan's site-specific installation may frustrate some viewers, but it does raise interesting points about the psychology of space. 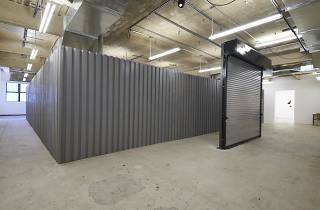 The piece consists of a wall made of sectional steel sheeting (a standard, off-the-shelf material), which follows the perimeter of the gallery about five feet from the existing walls. 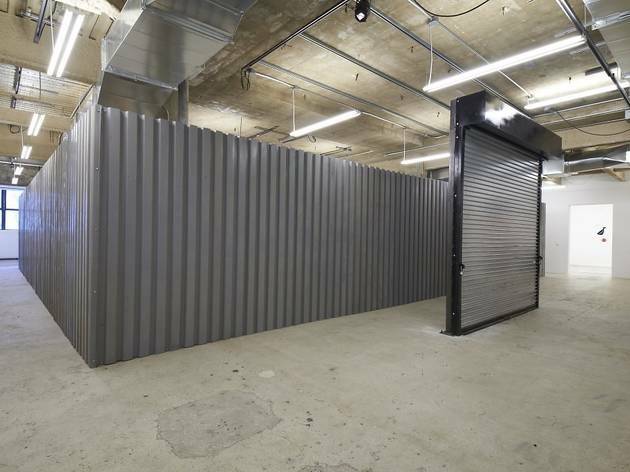 The structure is completely free of openings, except for one at the show's entrance, but that too is blocked by a roll-down corrugated-steel gate secured with padlocks. Visitors are free to roam the narrow corridor around the installation and to ponder what, if anything, lies within its inaccessible interior.